Tungsten carbide is a special coating on the surgical instruments to enhance the quality and life of the instruments. Description: Tungsten Carbide instruments identified by gold handles. With three users. These scissors used for general, multipurpose cutting and dissecting. Sharp scissors cut through tougher tissue and frequently used for dissecting. Blunt scissors more often used for cutting tubing or gauze. available tip configurations: sharp/sharp, sharp/blunt and blunt/blunt, straight or curved and multiple lengths. These scissors used for general, multipurpose cutting and dissecting. Sharp scissors cut through tougher tissue and frequently used for dissecting. Blunt scissors more often used for cutting tubing or gauze. Description: These instruments identified by gold handles. With three available tip configurations: sharp/sharp, sharp/blunt and blunt/blunt, straight or curved and multiple lengths. Notes: TC instruments designed to stay sharp for a significantly longer period of time than other standard instruments. Inserts permanently bonded to the instrument, maximizing control and precision. 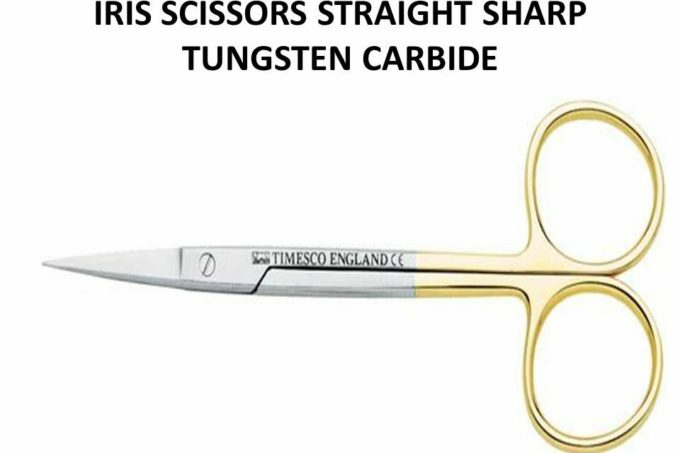 Uses: Originally designed for ophthalmic procedures, Iris Scissors has become a multipurpose instrument used in various surgical environments, emergency rooms, OB/GYN and dermatologic procedures. These fine, thin scissors ideal for detailed dissection of fine tissue and fine suture removal. Description: Identified by their gold coated finger rings, the tungsten carbide bonded onto the scissors for maximized control and precision. designed to stay sharp for a longer period of time than standard scissors.